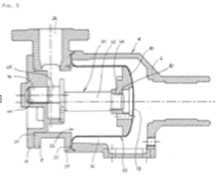 The United States Patent and Trademark Office has granted PeopleFlo Manufacturing a third patent for its EnviroGear magnetically driven gear pump. This patent protects a unique design that enables pre-stressing the magnetic coupling canister upon assembly. This unique design lengthens the fatigue life of the canister while minimizing canister wall thickness to minimize eddy current heat generation.